The PicoRaman spectrometer broadens the application areas of Raman spectroscopy by drastically reducing fluorescence interference. By using patented time-gating technology, PicoRaman spectrometer allows for making the most out of Raman spectroscopy, with new applications in the fields of science and industry. PicoRaman is the only commercial Raman spectrometer capable of time-resolved measurements. Raman spectroscopy is a very powerful technique on account of its intrinsically high molecular specificity, the requirement for minimal or no sample pre-treatment, the ability to measure aqueous samples, the flexibility of sampling configurations, and suitability for automation. Furthermore, Raman spectroscopy is a non-destructive, non-contact, label-free, fast and easy to use measurement technique. Time-gating increases the robustness and reliability of Raman measurements even further by enabling true fluorescence rejection. Fluorescence emission is seen as the main challenge in Raman spectroscopy. The patented Timegated® technology solves this problem. PicoRaman has sub-nanosecond pulsed excitation and a time-resolved single-photon counting detector, enabling effective and real fluorescence rejection making both quantitative and qualitative analyses more accurate and reliable. Spectral analysis becomes more specific and precise as fluorescence is no longer a limitation. PicoRaman opens up new possibilities for research and development e.g. in catalysis, metallurgy and combustion studies. 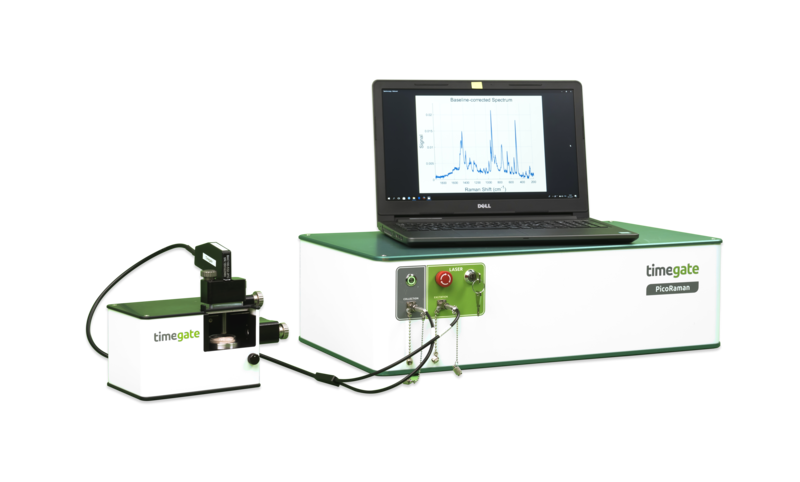 It is the only commercial Raman spectrometer using time-resolved technology, providing data on Raman scattering and time-resolved fluorescence. The advantages of conventional Raman spectroscopy are also available with PicoRaman. Additionally, PicoRaman is immune to ambient light, and it enables measurements in high temperatures without having to account for fluorescence. Efficient data acquisition is accessible for a wider range of applications than before. Aside from data on Raman scattering, PicoRaman also provides time-resolved information on fluorescence emission decay. The time-gating technology enabling this has its first commercial application in the PicoRaman instrument. PicoRaman consists of a spectrometer, laser, sampling optics, PC with NI I/O card and software. The instrument is compact sized, fits easily on a laboratory table and it is easy to transport to a sample collection site. Timegate experts will help you with choosing the right measurement probe for your research purposes. Time-resolved Raman spectroscopy for more applications for research and industrial use. Fluorescence has traditionally limited the use of Raman spectroscopy for analysis of certain materials. PicoRaman spectrometer utilizes patented time-gated technology that broadens the benefits of Raman scattering analysis also to materials of high fluorescent emission, and the requirement for less sample preparation also saves time and labour. PicoRaman spectrometer allows for analysis of a wide range of compounds in various physicochemical environments and temperatures. 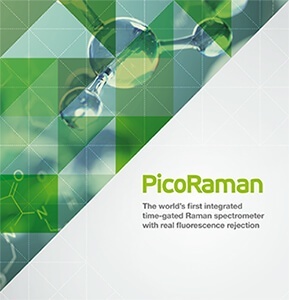 PicoRaman uses patented Raman technology, providing data on Raman scattering and time-resolved fluorescence. Time-resolved Raman spectroscopy has not been commercially available until now. PicoRaman is the new tool for accurate analysis for mining industry, fundamental chemical research, pharmaceutical settings, process analytical technology (PAT) and life sciences. PicoRaman instrument helps you to improve your production quality and reliability. Broaden the possibilities of Raman spectroscopy in your line of research or production. PicoRaman is the first commercially available spectroscope using Timegated® technology for accurate analysis. Ask for a quotation for your instrument.